I would like to wish you all a Happy New Year! This is the first behavioral economics podcast episode of 2019. Like so many of you, December is a time of reflection for me, and planning for the year ahead. I do like the “fresh start” that comes with a new year, new quarter, new month, new client or new project…but what happens when the newness wears off? [07:38] What do you think about resolutions? Personally, I have never been a big fan. [08:18] I have never enjoyed investing time in things that will fail. The subconscious brain makes 99% of your decisions. It makes those decisions based on proven rules of thumb which it has found to work over your lifetime or our genetic evolution as a species. 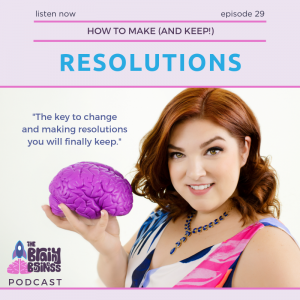 [08:44] When you say you want to change something you can have the best of intentions, but there’s a reason resolutions are easier said than done. [09:28] Our brains are constantly looking for rewards and many of the things that we find rewarding are the things that we want to change. [10:32] TIME DISCOUNTING – I call this the “Monday effect.” Have you ever said you would start something “on Monday”? Then…in what seems like minutes instead of hours…the alarm goes off. Where did the motivation go? Why do you feel like a completely different person today than you did last night? [13:07] Maybe tomorrow is a better day to start. Then tomorrow never really comes either. This is time discounting. [13:31] Studies have found that when you talk or think about your future self…the brain lights up as if it were talking about a completely different person! [14:20] “Future you” is actually a different person than you. [15:02] Time discounting compounds with overconfidence and optimism to make a perfect storm against change. We overestimate how good we will be at something. We also underestimate how long it will take to accomplish something. And overestimate how our outcomes will be compared to other people’s outcomes. [15:50] Making your future self “real” to you so that you see yourself in the commitment can make a difference. [16:21] People saved more for retirement if they were shown a picture of themselves that looked like they had aged 10 or 20 years. [16:55] 1. When you are making the commitments, ask yourself if the plan is realistic. Think about this in terms of yourself right now. [17:19] 2. When you feel like you want to hit the proverbial snooze button (and you will) remember the commitment you made and why it is important. [17:43] 3. When making your commitment, make it something you can turn into an “I don’t” statement. [18:25] Anticipation of regret is a huge reason people delay taking an action. [19:11] One reason regret is so powerful is because of counterfactual thinking. This is easier known as “what if” or “if only” thinking. [20:28] Your brain will combine the best features of unselected (and heavily evaluated) items into a “super choice” (which doesn’t really exist) to make you feel even worse. In this example, your brain creates a super safe, awesomely stylish car that you “could have had if only you hadn’t picked the stupid good deal” car. [20:41] Our brains want the immediate gains and benefits of “now” instead of waiting for something that is good for us in the future. [21:32] To make your resolutions stick, watch out for anticipated regret and all the times you start to think about “what ifs” and “if only’s” that aren’t leading to your goal. [21:52] Before you pick your resolution, be sure it is something you really want and are willing to make a change for. Think about why it matters and come to terms with the things you are going to give up in order to get it. [22:40] There has been debate over the years as to how willpower and self control are created and maintained over time. [23:05] New research out of Texas A&M University’s Human Behavior Lab has found that it is actually BOTH – a battery and a snowball. [26:59] When you try to commit to too much and come in too hard and too fast, you are setting yourself up to fail. [27:27] Setting yourself up with too many goals and tasks is also a recipe for failure. You can’t focus on so many things at once. [27:48] What is the one thing that will change your business next year, and how can you put all your effort toward meeting that one goal? [28:40] Advice from Warren Buffett: Write down your top 25 goals for your life and business. Circle the top 5 most important goals. What happens to 6-25? They become your “avoid at all costs” list. [30:30] Not having a clear focus and narrowing down your purpose is why we lack self-control and have a hard time making changes. [31:18] You have to learn to say no. You need to make sacrifices. It will be hard, but it will be worth it if you pick the right things to focus on. [31:44] You only get to move one step at a time. All change – from weight loss to massive business success – comes one small step at a time. [32:06] If you make your list of 25 and narrow it down to a top 5, I am telling you to bring that down to a top 1 to 3 MAX for your resolution or big business goal for 2019. [35:42] You will not have a flawless path, there is trial and error. You may expect a snowball and get a battery. [36:10] Expecting error (part of Richard Thaler’s acronym NUDGES) is why the car dings at you when you forget to put on your seatbelt. [36:41] Make a list of all the spots where you might be likely to slip for those top three goals you have set – your 2019 resolutions. [37:54] If you have a resolution around more effective networking, set goals before you go for how many connections you are going to make – and schedule time in advance to follow up. [38:47] If you focus on something, and everyone else knows it is important to you, if it is the thing you live and breathe and are 100% of the time, you will move forward. [39:30] You need to limit the focus and think about the small steps you can take to BE thoughtful about this one thing (or three things). [41:06] How can you help your customers have more realistic goals they can achieve and feel good about? [41:51] Does your lead magnet speak to these goals people will focus on and give them an immediate win? Thank you for a wonderful podcast. It is so timely at this time of the year. Thanks for the nice comments about the Human Behavior Lab at Texas A&M. Looking forward to meeting you in person next week. Thank you Dr. Palma! I look forward to meeting you and the rest of the team as well!